Can I edit my RSS feed metadata? Can I disable my RSS feed? An error appears when I try to load my show's RSS feed to Apple Podcasts, saying there's a problem with my cover art. How do I fix this? What happens to my episode in Apple Podcasts if I mark it as "explicit"? What happens to my show in Apple Podcasts if I mark it as "explicit" when customizing its RSS feed? All users, including those with a Free Speech plan, can copy and paste the RSS feed link we provide directly into an Apple Podcasts page or feed burner, and the information provided on the show's Spreaker page will automatically be extracted and used. However, users with every PRO plan, from On-Air Talent to Station, can manually customize their RSS feed. Yes, you have the ability to disable both your user RSS feed, as well as the feed of any one of your shows. To disable your user RSS feed, go into your profile's Settings page and choose RSS Feed Customization from the menu on the right. From the drop-down menu at the top select Disable, and then Save. To disable a specific show's RSS feed, first go to the Content Management System, choose your show, and click on the Edit yellow button. Then choose RSS Customization from the menu on the left. From the status menu at the top select Disable, and then Save. Learn more about Spreaker’s RSS feeds by reading the dedicated article from our Knowledge Base. Go to the Content Management System (CMS). Select your show and find the RSS Link button. Click on the RSS button, which will open the RSS Status box and hit the Copy button, as showed below. From there, paste the RSS feed link you had copied from Spreaker and then click Validate. 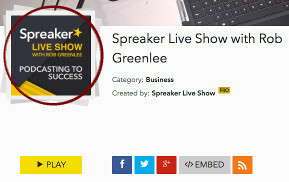 If validation fails, go back to your Spreaker show page and edit any of the failed fields (for example, you can go to your show's page and click on Edit to change the image, description, title, etc.) and then try validating it again. More info on that can be found here. Once validation goes through, click the Submit button. If you still have questions on Apple Podcasts' process, you can read their Help page on the Apple website: Podcasts Connect Help. The cover art Apple Podcasts is referring to is actually your show square default image (not your banner or profile picture). Make sure that this picture is at least 1400x1400 and smaller than 3000x3000. Episodes set as "explicit" on Spreaker will get the "explicit" label on Apple Podcasts as well, and a small "E" will appear alongside its title. You can mark modify setting anytime time by editing the episode"s information and ticking the "explicit content" box. If you mark a show as "explicit" on Spreaker when customizing its RSS feed, it will get a "Parental Advisory" label on Apple Podcasts. First, enable RSS feed customization by upgrading to any Pro plan. Access the Content Management System (CMS) and choose your show. Click on the show's Edit yellow button. Select "RSS Customization" from the menu at the left. Change the RSS status option to Manual. Scroll down the page, tick the "Explicit" box, and save.